This message is self-explanatory and is quite simply caused when you enter the wrong user name or password when logging into an ICF application i.e. an individual web dynpro application or the SAP portal etc. Check that you have got the correct username and password (may be case sensitive) and try to Log on again. 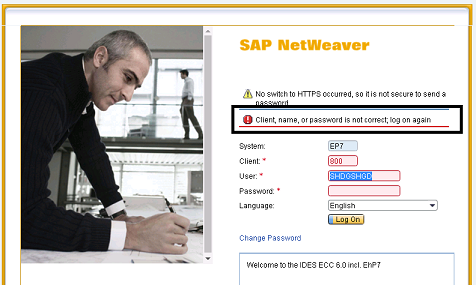 Remember you are trying to log into a back-end SAP system so it will be same login details used for this! If you still can’t get it to work, please contact your basis team to reset the password.